Here are my (belated) reading goals for 2017! I’ve been thinking a lot about the books I managed to read in 2016 and how I can adapt that in 2017 so that I can not only get more enjoyment out of my reading but hopefully also continue to learn more and more through books. 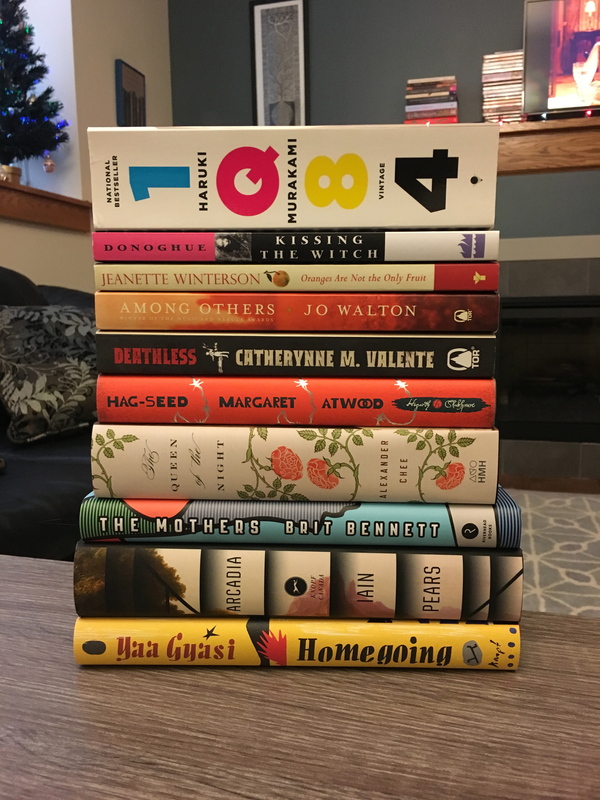 Pictured above are the ten books at the top of my TBR list for this year, and below are the goals that I’ll try to use to shape my reading in 2017. Reading Goal #1: Read more than one classic, including one longer classic – I completely failed at my goal to read at least one classic in 2016 (I read zero) but this year I’m determined. My classics reading has really taken a nosedive in recent years, but I really do enjoy them–not to mention I hate feeling like I haven’t read certain books that pretty much everyone else has. Reading Goal #2: Read more diversely – I didn’t do as well at reading diversely in 2016 as I’d wanted to. This year, I’d like to significantly increase the percentage of books I read by diverse authors. Reading Goal #3: #readmyowndamnbooks – 2016 was a huge year for book buying for me, and my physical TBR shelves have exploded. This year, I’d ideally like to focus on reading the books I own for the majority of my reading so that things don’t get too out of control. Reading Goal #4: Read more big books – I’ve always been a huge fan of immersing myself in giant reads, but it’s something that I think being involved in bookish social media has somewhat dampened for me in the past few years. I think that I’ve been putting pressure on myself, intended or not, to read a certain number of books per month, and the fact that it takes me longer to read a 500+ page book has played into my decision on whether or not to pick up those longer reads. I’d like to try to ignore that “pressure” and instead just focus on what I really want to read, whether it’s 100 pages long or 1,000. Reading Goal #5: Read more lesser-known and/or independently published books – Again, this goal goes back to being more active on Bookstagram and Litsy, as well as the blogging community. There are some books that we tend to see more than others on bookish social media, and they do tend to be new releases and YA books. There’s nothing wrong with that, and I do like to read both new releases and YA some of the time, but I also think that I need to do a better job at picking up books that aren’t as well-known and to discover hidden gems that aren’t always hyped up online. Reading Goal #8: Relax, and enjoy what you read – Sometimes I can get too caught up in TBR lists and reading goals, and the resulting pressure can nudge me into a reading slump. So in 2017, I need to let myself realize that reading is fun and amazing no matter what I’m reading, and I don’t always need to overthink things. Reading is what I love, and it should be something that relieves stress, not adds to it! What are your reading goals for 2017? Let me know! I love how well thought out your goals are! I have goals, but this year I didn’t put as much thought into it. And I mean that to say I didn’t pick long reads or classics or anything like that. I’m doing the #BeatTheBlacklist Challenge this year because my TBR pile is completely out of control and the majority of the books on the list have been there for ages. I plan to participate in the challenge on the website, clocking my pages and reviews and such, but it’s more a personal thing too. I really need to stop buying new books (yeah right!) and I need to read the old stuff instead of ignoring it for new stuff. I’ve also challenged myself to read banned books (which sometimes coincides with the other challenge). I like the idea of reading books that people think are “inappropriate” for whatever reason. Just to make it a slap in the face to people who think it’s all right to censor reading materials. I love your idea of bigger reads. I love books that take more than a day or two (for me) to finish. This comment has just become a big read, sorry. I wish you luck in meeting your reading goals this year! Reading banned books is an awesome goal. I think you’ll probably find some fantastic reads that way and I love that you’re taking a stand against censorship. Good luck with your goals and happy reading!!! Lovely goals! Mine are to re-read more and to do fewer challenges. The ones I’m doing are All Virago / All August and 20 Books of Summer, both of which I can do using my TBR or re-reading to achieve. Happy reading for 2017. I recommend Trollope for a big classic, by the way, and maybe a new author for you to love! Those sound like great goals to help you enjoy your reading more! I’ve never picked up a book by Trollope, will have to check him out for sure. Happy reading to you too!